BRC Global Standards is a leading safety and quality certification programme achieved by passing a BRC audit. The standard is used by over 26,000 certificated suppliers in over 130 countries, covering a variety of business; food producers, storage & distribution, wholesalers and brand holders. Our consultants are highly qualified and experienced across a range of food sectors implementing and maintaining BRC Global Standards. Offering you bespoke consultation and support, based on your budget, we can help you prepare for, pass and maintain your own systems, for BRC Food, Warehousing, Storage and Distribution or Packaging. Depending on your geographic location, help with our consulting fees maybe available. We can check your eligibility and get our personal Growth Manager from the Manufacturing Growth Programme to go through the funding process with you. Based in Sussex, Eskimo Ice manufacture Ice Cubes supplying major retailers. Setting up the food safety system. Providing paperwork templates to build on from what they already had in place and allowing them to make the system their own. Mentoring their management team in managing the system themselves, understanding the paperwork allowing them to manage the audit without our presence. 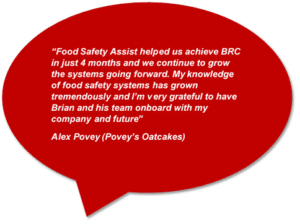 Over the last 4 years Food Safety Assist has continued providing BRC consultancy support through HACCP reviews, Internal audits and traceability exercise.